Exhibition of works by the group “Chempioni mira” / “World Champions”(Giya Abramishvili, Konstantin Latishev, Konstantin Zvezdochetov, Boris Matrosov) created in the 1980s – 1990s aims to introduce a particular phenomenon of Russian contemporary art, quite unfamiliar to the Latvian public. This “Russian style” of painting is well-known elsewhere and is represented here by four artists’ works. Their originality stems from the use of humour, self-irony, grotesque imagery, subjects of situational comedies and absurd texts from the immense repertoire of Soviet-time experiences. Participants of the “Chempioni mira” / “World Champions” group retain significant place in the context of Russian contemporary art. All members of the group are actively taking part in exhibitions; no important shows of Russian contemporary art abroad or international events happen without them. They have also represented Russia in the Venice Biennial on several occasions. The founding father of the group “Chempioni mira” / “World Champions” is the classic and star of Russian contemporary art KONSTANTIN ZVEZDOCHETOV (now the artist, aged fifty one, has organised his solo exhibition with a provocative title “Ne vyderzhal”/ “Given Up” at the Moscow Museum of Modern Art founded by Zurab Tsereteli. The artist’s works are on view on the Museum’s four floors, three of them displaying new works and one showing a retrospective). 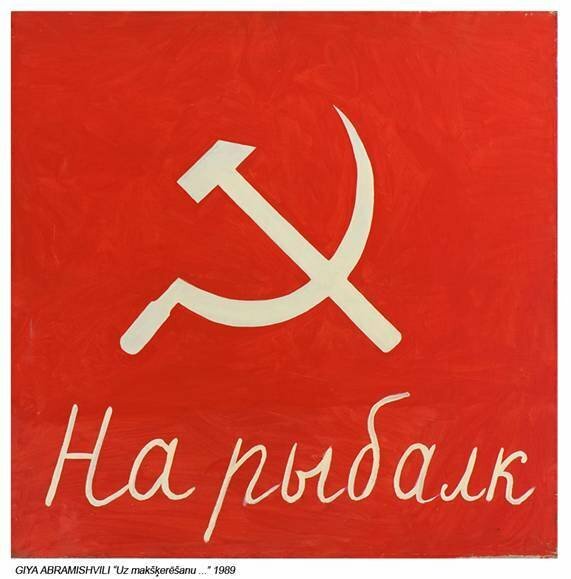 Zvezdochetov who is considered to be one of the wittiest and clever participants of Moscow art scene, started as a member of the group “Mukhomory” / “Toadstools” in the 1970s; it was a sort of more anarchic alternative to the conceptualists’ serious enterprises. Performances, painting and even music by the group quickly became a cultic phenomenon. When the artist was forced to join the Soviet Army, he founded a group with a brash name “Chempioni mira” / “World Champions” and started to develop a post-modern painting style. The series of paintings titled “Perdo” is considered to be his best achievements of the late 1980s. It is a painterly anti-utopia dealing with a same-name totalitarian state whose main sacred symbol is a bloody red and sweet watermelon. His most imposing project of the 1990s is the installation “Artisty – metrostroyevtsam“/”Artists for the Metro-builders”; it reminds of a mosaic featuring the protagonists from the famous comedy directed by Gaidai – Trus (Coward), Balbes (Fool) and Bivali (Experienced). During the last years illustrations from the magazine “Crocodile” remains the most important source of inspiration. He uses to say that “Crocodile” is a magic crystal opening up the whole world. Having started as an artist depicting Soviet stereotypes in an absurdist vein, Zvezdochetov is one of the few who had managed to retain and develop his style over two decades. Zatlers returns amendments to Immigration Law to Saeima for second review Are they buying less? Time to face the music armed with this great inomfrtaion.